It happened. It really happened. He did it. He did it. It really happened. As a writer, you come to big moments like this and hope to write some lede that is in some way poignant, or witty, or at least memorable. I’ll start by admitting defeat. I have nothing. Nothing preconceived, nothing wire-framed, nothing drawn up in my head as a way to write this piece. It wasn’t supposed to be possible two years ago, or maybe even a year ago. You don’t come back from back fusions, the chip yips, the inability to walk, the inability to stand, the TMZ rumors, the publicly available sexts about Subway sandwiches. You are supposed to fade into the sunset. You do not look the progression of time in the eye, and tell it to shove it. That is not supposed to happen. Perhaps it’s why I’m physically shaking right now, and trying to come up with words and falling short. There are none. We’ll need days, weeks, months, and possibly years to digest what we just saw. Somehow, someway, Tiger Woods is a major champion, again. Woods fired a 3-under final round of 69 to edge Francesco Molinari, Brooks Koepka, Dustin Johnson, and a glut of others on an absolutely wild day at Augusta. There was every ingredient. Francesco Molinari, who was supposed to play the foil, melting down the stretch like so many Woods victims of yesteryear. Koepka lingering around the top and having a chance to put pressure on him at the end. Xander Schauffele and Patrick Cantlay hopping in with cameos. Oh, and the overall weirdness of the fact we’re playing in the morning and racing to finish to beat severe weather. There’s too much to unpack in the moment after, but the shot that will go down in the history of sport forever might be his tee shot on the par-3 16th — where so many Masters moments have been etched in stone. A right-to-left drawing 8-iron settled just on the slope above the traditional Sunday pin position, and slowly trickled down to within a couple feet of the cup. I was screaming in my living room at this moment, as I have been for the past several hours. There’s so much to digest here. 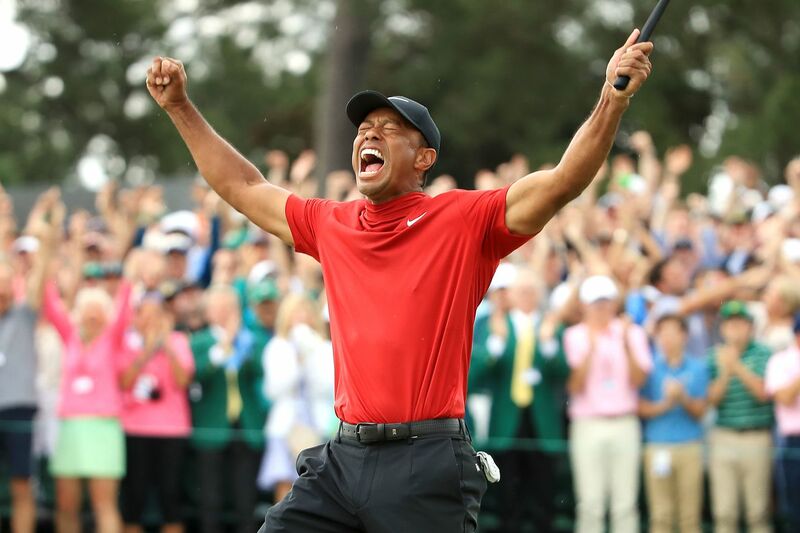 It’s Woods’ first major win since the divorce and the scandals in 2009, the injuries, the surgeries, and more surgeries. The 2008 ACL surgery. The swing rebuild. The bladed chips and yips. The literal inability to play with his kids in his backyard just 24 months ago. It’s his first Masters in 14 years. It’s the first time he’s come from behind to win a major. And above it all, he looked like Woods doing it. Molinari, perhaps the best player in the world at the moment coming into the day and known for being stoic in big moments, wilted like victims of the early 2000s. The red mock. The command off the tee. Vintage Woods in absolutely every single way. Where do we go from here? It’s hard to say this is a fluke. Woods is going to be coming off of a major heading to Bethpage Black for the PGA next month, and then Pebble for the US Open after — two courses he’s owned in his career. It’s not insane to say we could be doing this again, and soon. The day started with a front nine back and forth between Woods and Molinari. Molinari looked unflappable mentally. The two-way miss that emerged on the front side was evidence he maybe didn’t have his best stuff, but his unreal perfect scrambling percentage was a testament to the steely reserve that powered him to an undefeated performance at the Ryder Cup and his Claret Jug win at Carnoustie. Then, he met an all too familiar fate at the par-3 12th. In shades of Jordan Spieth a couple of years back, swirling winds pushed Molinari’s first backward into the pond. That led to a double bogey that opened things back up for everyone. A glut of players that had been a bit out of the TV coverage came back in — Johnson, Schauffele, Cantlay, and more. Molinari bounced back on 13 and 14 to hang around, and then came this on the par-5 15th. With Woods waiting ahead on the green with a putt for eagle, Molinari had laid up on the left side just short of the Sarazen Bridge. Shortsided to a left side pin, Molinari hit a wedge up into the sky that just clipped a tree, and knocked it down into to the drink. Two putts from Woods for a birdie put him just ahead, and up by one alone heading to the 16th. After the birdie on 16, it was a semi-comfortable walk to another green jacket for the Big Cat. Now, we’ll turn attention to the PGA Championship in May at Bethpage where Woods will look to add major championship number 16. And that is a sentence I never thought I’d write.